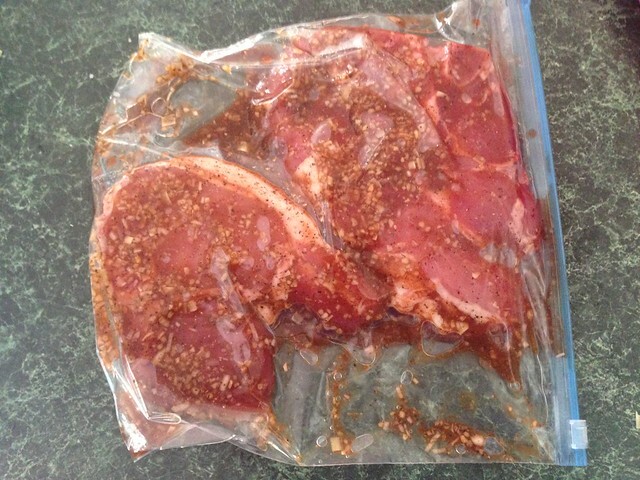 Mix all of the marinade ingredients in a large plastic bag. If you have time or the equipment, grind the shallot, lemongrass, and garlic together for a finer paste. I didn’t and they were still delicious. 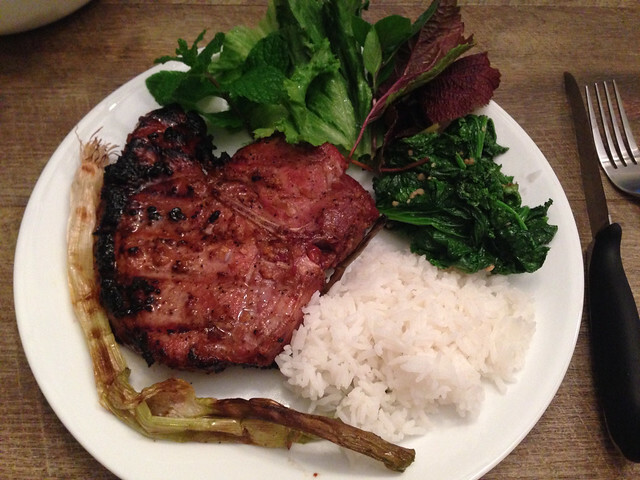 Pierce your pork chops all over to absorb as much of the marinade as possible. I gave the chops a nice little massage too. Anything to make them happier. Leave the pork in the marinade bag for several hours, if possible, up to over night and flip occasionally (don’t forget the massage). 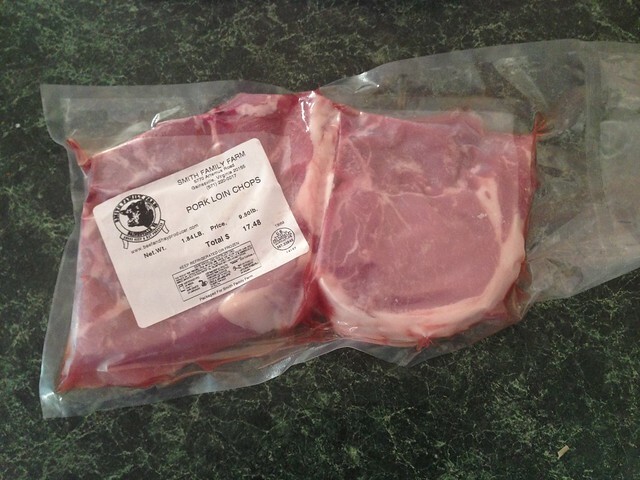 Toss ’em on the grill and cook to 145 degrees internal temperature then enjoy! Serve with simple stir fried vegetables or simple soup. I set out a plate of fresh vegetables and herbs which was perfect. Hubs didn’t like the braised mustard greens (also fresh from the farmers market). 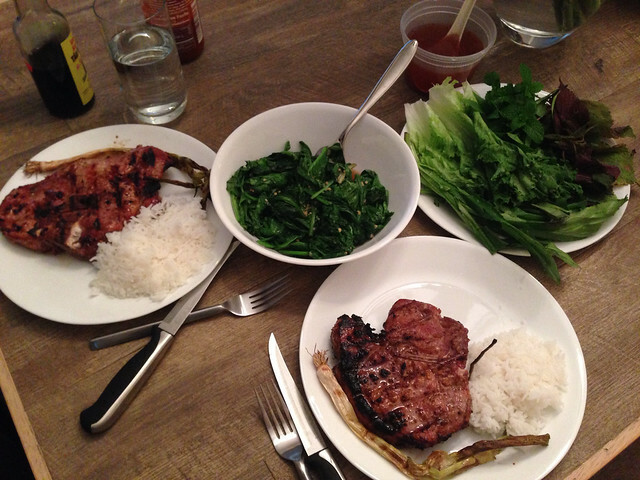 He likes his mustard greens pickled with Thit Kho Nuong. I thought they were delicious. You decide. Mix the first four ingredients well and set aside. Saute the garlic in one tablespoon of oil until fragrant. Add the greens (make sure they’re well washed) until warmed through and bright green. Add the flavor mixture and toss until wilted but still yielding a crunch.